Delta announced their new revenue-based points-earning scheme last week, and curiously absent was details of what changes were going to look like on the redemption side of the equation. Delta had told us there would be a five tier redemption chart, unlike two tiers that most programs have and three tiers that Delta has had since 2008. But that they wouldn’t reveal the specifics until the fourth quarter of the year. I’ve been highly critical of Delta for the decision to hold back details of changes to their award chart. You can’t evaluate a program knowing only how points are earned. Redemption is 50% of the equation. Members are earning points now that they will redeem next year, and Delta wouldn’t tell their members what those points would be worth. Delta knew the chart, but it was a secret chart. Until now. As I shared last night, Delta decided to release details of their 2015 award chart now instead of waiting until at least October. As much as I gave them a hard time for their initial secrecy over their impending changes, I have to give them real kudos for recognizing a mistake and being willing to acknowledge it and change course. We already knew that we’d get miles and cash awards (no new details announced about those yet) and one-way awards for half the price of roundtrip (like American and United have offered for several years). What’s new are the award charts for all-miles redemptions. But Delta has only shared their new award charts partially — they’ve posted a .pdf file of their new award chart but only for trips beginning or ending in the mainland U.S., Alaska, and Canada — and not the award charts for the rest of the world. (It was only three years ago that they bothered publishing award charts for the rest of the world at all, the best worldwide travelers could do was guess what an award should cost based on what Northwest used to charge before the two airlines merged). Delta announced a major set of award price changes back in August for travel beginning June 2014. They also couldn’t quite wait for those higher prices to go into effect, so they initiated an interim devaluation in November. Both of those changes were made without notice, and applied to bookings being made immediately. Having done that already, the new award charts do not increase prices at the saver level. And in 3 out of 44 award categories, saver awards drop 5000 or 10,000 points. What they do, however, is increase the number of award categories from 3 to 5 — for both economy and for business class — meaning there are now a total of 10 award categories as part of their chart, up from 6 (and compared to 4 at United and American). They’ve made it more complicated to know what to expect. Here’s the economy class award chart, with all 5 levels and the same sort of shading. So What Does This Mean for Pricing of Awards on Delta? We really do not know what this will mean for Delta award prices in practice. As I observed yesterday, it will be impossible to tell how this will affect travelers in 2015 until that time comes — because it is all contingent on how much award space is made available at each level. Will there be as much saver award space available as before? If so, this has to be seen as an improvement other than for last seat availability where prices are indisputably going up. Will availability gravitate towards higher categories? This would be a stealth way of devaluing the redemption side of the program. You keep the lowest pricing effectively intact, and just don’t offer seats at that level, making level 2 the de facto saver award that most customers can get. My bet – and I cannot say this with certainty – is that over time Delta awards will be more expensive rather than less expensive from the perspective of someone looking for saver award space. Interestingly, this chart also rolls back some of the extreme prices for last seat award availability. Some of those prices were truly shocking, and in this chart fall from 20,000 – 35,000 miles. 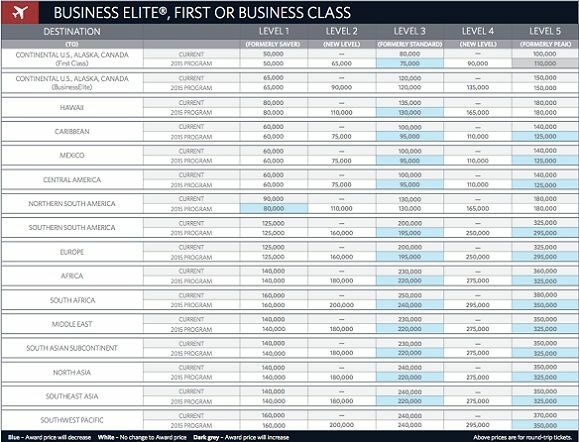 Long gone are the days you could just spend double miles and get any seat you want, though — South Africa business class last seat availability drops from a peak of 380,000 but is still mind-numbingly expensive at 350,000 miles. I also expected the changes to be worse. Delta’s lowest level award prices remain roughly on par with the competition availability issues aside. Delta has decent award availability on its partners like Virgin Australia, China Southern, China Eastern, Saudia, and Aeroflot. What Delta hasn’t been known for is decent availability on its own flights. So the real sweet spot has been redeeming Delta miles for premium cabin awards on partners, often with the biggest problem being finding a domestic flight to the international gateway city (the city from which you depart the US). And these changes on their own do not make those partner awards more expensive. As a result this is not a devaluation at all for me because my interest in Skymiles is not redeeming to fly on Delta. My interest is redeeming on partners and that availability only exists at the lowest level. That availability should not change, unless Delta chooses to block award space that their partners are offering (it’s certainly the case now that I can book awards on Air France using Alaska miles that Delta will not let me have using Skymiles, so there may be some of this now). Bottom-line: The low prices are very similar to what they offered before. The high prices are what they offered before. Now there are more gradations in the middle, and the action is all going to be in what availability looks like for each. We won’t know that until next year. It’s a more complicated award chart, but it’s not a true revenue-based redemption system, and partner awards should still be about the same as they were before. So there’s no new alarm or concern in the award chart at this time. I do wish, however, that Delta would release the rest of their charts for travel between other regions of the world than the US 48 states, Alaska, and Canada. With this new 5 tier system they are going to release I’m guessing 1-2 seats at the lowest levels with more increasing as you go up the chart. So you will need to be keeping an eye out to book as soon as it’s released. Then Delta can say: “We always release all award availability” when in reality it’ll still be difficult to find. Does the chart say partner awards are all at saver levels. If not, I bet they go way up. Might still be only one price but not the low price. 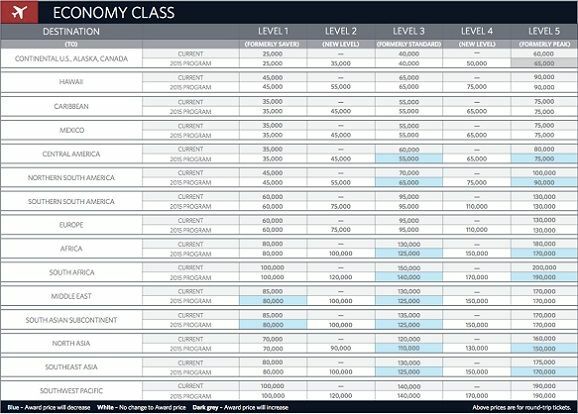 If there’s no change in partner award levels (which seems logical, but since we’re talking Delta, who really knows) this overhaul of Skymiles would seem largely irrelevant to the “sophisticated” traveler who reads this blog. I would assume very few such travelers earn the majority of their miles by actually flying. If that’s the case, the likely decrease in their earnings will be fairly modest, and probably not very material to them. Meanwhile, most readers probably already avoid accumulating Skymiles if they can help it. That’s obviously not going to change; perhaps the aversion becomes a little stronger — assuming availability of awards doesn’t become better. I wouldn’t put it past them to make partner awards only available at level 2. That said, flying Upper Class was a ton of fun and a memorable redemption. So DL is actually nearly 100% for flights I’ve wanted (of a sample size of 1). What will happen to the miles I already have? If I currently have 150,000 miles based on miles flown v. revenue will those be adjusted down to reflect what they’d be worth under the new system? @Melissa – these carry over, nothing changes with your banked miles. In one of the earlier versions of changes Delta looked at, I understand that there were some potential changes. But those didn’t get made. Your banked miles are safe. @Curtis – Delta does not offer redemption for international first class. Business class is the top redemption offering in the Skymiles program, which is one of the real knocks on the program *for me* [not for most people]. @iahphx – I have specifically confirmed with Delta that there is no separate partner award chart, like there is now with United. @beachfan @jason it would be pretty underhanded of Delta to declare that partner awards were no longer low level / level 1 prices. That would be a huge devaluation, and it would suggest that Delta was being disingenuous when going out of their way to release the award charts as a sign of good faith with their members. So I have to believe that’s not what they’re doing. I have to take them at their word. Will I be able to find any award space on AF or KLM? Good luck finding availability on level 1. Level 2 is the new level 1 and should be compared to AA and UAs award chart. In practical terms, this is a major devaluation for those wanting to travel on Delta. Travel to EU will continue to be tough in coach and business class given their partners. I posit that the more discrete award levels they have (now 5, and who knows, 10 at some point? ), the more likely they will correlate, perhaps only loosely, the the underlying fare to the award level required. Should this occur, they will be, in any substantial way, a revenue based redemption system. Thanks for that confirmation, Gary. If they don’t mess with int’l redemptions, these changes — while generating lots of interest — are pretty much a yawner. It’s virtually impossible to redeem on DL metal now for a price you’d be willing to pay, and that’s not likely to change. Perhaps the greatest impact of this overhaul will be to eventually prompt DL’s competitors to go to some sort of revenue-based ff program. That’s not likely to be good for travelers, but is probably inevitable. The oddest thing will be what happens to mileage accrual on DL flights credited to OTHER ff programs. I mean, if they don’t change the rules, everybody (except elites) is going to credit our flight to Alaska. I assume this “problem” will eventually be addressed by a series of additional complicated charts showing reduced mileage accrual on DL metal by their partner airlines. @ABC, you’re just making that up. You don’t actually know what will be available at level 1 vs. level 2. And I tend to think Gary is right that Delta is being honest in saying there isn’t going to be a new partner award chart like UA has (and AA sort of has, depending on what you’re trying to do), and that partner awards will still book at Level 1. If that’s the case then partner awards on Delta to the EU will actually be cheaper than with UA in miles, and cheaper than with AA in $, because of the high YQ and fees on AA’s main partner to EU, BA. I guess I don’t see how one award chart doesn’t mean that the partner awards won’t be at level three or higher. Gary, did they tell you it would only be at level one? As far as the argument that it would be disingenuous of them, well that makes me believe it more –aren’t they the most disingenuous airline by far? The biggest issue – now – with partner space is Delta’s unwillingness to book some of what is actually being offered. Compare the Air France space that you can book with Alaska miles, on the Alaska website. And then try to get Delta to book it. Delta only offers a subset the award space on Air France that Alaska and other Air France partners offer. of course it’s speculation. Just like Gary’s and Lucky’s assumption that “it doesn’t look that bad”. When has an award change ever been good with Delta. This is a nice parlor trick to make ppl look at the changes as reasonable. I have had no success redeeming award tickets at the saver level. I will be shocked if that will be easier in 2015. Airlines seem, by and large, to resist too much inquiry into their trade practices, but I would hope the FTC and attorneys general would be looking at this. To me, if they just wanted to release their chart, and let it be, that would be fine. But I think they’ve gone a bit far with their blue and dark gray coding and trumpeting the fact that the levels are supposedly staying the same. If it turns out that, for example, they offer after 1/1/15 less space on average in levels 1, 2, and 3 than they they used to offer in saver and standard combined (again on average), I would say these new charts very well could constitute consumer fraud. If they simply are secretly devaluing by moving some formerly standard award space to level 4, but then using the blue bars to claim they are not increasing it, I think it would be a deceptive trade practice. And my guess is that’s exactly what they are going to do. I think they were a bit blindsided by the publicity hit they took on revenue mileage earning, and they wanted to create some good publicity with these charts, leading to creating a chart full of blue to pretend that award redemptions are going down. What possible reason does an airline have for creating five tiers of redemptions levels? One can fumble around for an answer, but in the end, Occam’s razor seems to apply. They are doing it to mask a devaluation. I hope to be proven wrong, but it’s not like they’ve built up much good faith to suggest I will be. @Matthew – to be clear (and I thought I was clear in my comments above) I asked about whether there would be a separate partner award chart (the way United has), and they said no. I did not ask the question whether partner awards would be charged at the low level as they always have since only saver and no ‘extra’ award space is made available. You are just delusional if you think DL will not be devaluing partner awards. Not just through new charts (why would you trust them to give YOU advance notice that they don’t give anyone else much less a promise not to do it) but also by manipulating inventory (see *A blocking on UA). DL – like UA – is almost certainly aware of the hit it takes every time one of your fans books a partner award. Enjoy the gravy train while you can, because it will run out soon. Management is just focused on other things now like rolling out this devaluaiton. The thing that matters to me is whether they will make available any seats at the low level. We have no way to know that for sure, but there’s a lot of history to suggest they won’t. The availability of one-ways is an improvement, since it now means that if I can ever find a Delta seat one-way, at least I can book it and use another program in the other direction. So maybe I can finally put a dent in my stash of SkyPesos, which has sat unchanged for a long time now. I would trade two SkyPesos for one UA or AA mile straight up in a heartbeat. What @ABC said — redeeming at the Saver level hasn’t really been possible for years. I’m not interested in saving up miles in order to enter a lottery that I’m not going to win. I really don’t know what people are thinking who continue to collect SkyMiles. How is releasing this chart in violation of the law? How could that possibly be illegal? If it is, that’s crazy. I don’t understand all of the fuss about this. As a marketing professional whose expertise lies specifically in travel loyalty programs, I actually applaud what delta is doing here, which is rewarding their high value customers and preserving the integrity of the (high value) in-flight experience. When the flood gates are open and the redemption threshold is too low, the quality of the premium travel experience is diminished. Tying mileage accrual to consumer expenditure (MQD) within they airline is the right thing to do. Miles accrued via a credit card all all fine and dandy, however those miles do not accurately portray a Delta loyal traveller, rather a person who carries and uses an Amex that is co-branded with Delta. In my loyalty projects, I typically focus on rewarding the high value, high loyalty customer first…. And then trickle down the ladder, providing a lower tier of rewards to a less valuable, less brand loyal consumer. Make sense? And to the person who said the more complex, the more loopholes there will be, you are 100% correct. Study the program carefully and you will find ways to not only get great Rewards but I think you will also receive a superior travel experience, because they will work very hard to please the customer sitting in the rewards seat. It’s a good thing. @AtlantAnne – it isn’t, but Delta has in the past claimed that doing so would be, which is 100% crazy (rather the technical term is “a lie”).